» REVIEW AND HISTORY – The 1959-60 PHILIP MARLOWE TV Series, by Michael Shonk. REVIEW AND HISTORY – The 1959-60 PHILIP MARLOWE TV Series, by Michael Shonk. PHILIP MARLOWE. ABC-TV. 1959-1960. Tuesday 9:30-10pm(E). Goodson-Todman Production with California National Productions. Created by Raymond Chandler. “Murder Is a Grave Affair.” March 8, 1960. Written and produced by Gene Wang. Directed by Paul Stewart. Cast: Philip Carey as Philip Marlowe, William Schallert as Police Lieutenant Manny Harris, Gene Nelson as Larry, Jack Weston as Artie, Betsy Jones-Moreland as Marian, Maxine Cooper as Janet. Episode available on DVD: TV GUIDE Presents Master Crime Solvers. A young woman in love with Larry, a married movie director, confronts his wife. The wife, Marian tells the girl she won’t stop Larry if he wants a divorce, and then celebrates with her lover. Larry is not happy. The girl means nothing to him, just one of a “hundred.” She threatens to go to the papers. Larry also has to deal with the reaction from his secretary and lover, Janet. But he’s a guy and these things happen. The girl turns up dead due to an unvented gas heater. Her friend Artie, who loved her, finds the body. Both he and the girl’s father believe Larry killed her, and Dad hires Philip Marlowe. Marlowe uses the typical TV PI’s method for solving crimes. The suspects are cleared one by one until only one remains who, in a burst of illogic, no hard evidence, and the closing credits fast approaching, confesses. 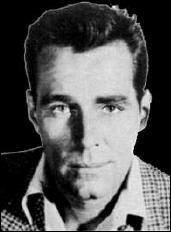 Philip Carey could have made a great Marlowe, but the way the character dressed and lived, the fake scar on his cheek, his attitude towards the cops, all of it left Carey playing a character unlike the one Raymond Chandler created. Among the few positives, Betsy Jones-Moreland as the wife played the part with an odd amused indifference that was a fresh choice for that type of role. The script featured a brilliant twist that would surprise viewers today. On the negative side, the theme music is a forgettable jazz tune with a slight Bossa nova beat, as you can hear from this YouTube clip of the opening credits. There were no noirish elements, even the Day for Night scenes at the graveyard lacked any style or visual substance. Take the Philip Marlowe name away and this was just a good TV mystery typical of the time. Now, a look at the creation of the series. It began July 1957 when a deal was signed between Raymond Chandler and Goodson-Todman Productions to produce a TV series based on the character Philip Marlowe. According to Billboard, July 22, 1957 issue, Chandler would be the series story editor. At this point the pilot was to be filmed in August 1957, Goodson-Todman producing with Screen Gems. Casting had not yet happened nor had the episode length been decided, though the hour-long format was favored. The plan was to sell it to a network for September 1957 (Billboard, July 29, 1957). Broadcasting (February 10, 1958) reported the pilot done but not yet sold. March 26, 1959, Raymond Chandler dies. Was he still involved with the show? I doubt it. For some reason the series appeared on ABC not NBC and lasted only (reportedly) twenty six episodes before it was dropped. Broadcasting (September 28, 1959) had a review of the first episode. Scroll down and click on 9/28/59 issue and scroll to pages 48 and 50. No title for the episode is given and it lists a different producer (William Froug). It gives the air date as September 29, 1959 instead of the currently believed October 6. Based on the review, Marlowe is hired in that first episode by a reformed gangster to keep his daughter from running away with a young man. The young man and Marlowe fight. Marlowe wins. A gangster with a grudge against Marlowe’s client helps the kid to take on Marlowe again. Marlowe wins but during the fight the bad guy kidnaps the girl. Marlowe chases. Marlowe and bad guy fight. Marlowe wins and bad guy is killed. Time magazine did a cover story “These Gunns For Hire” (October 26, 1959) about the TV detectives of the 1959-60 season. I highly recommend you read the entire article, which you can easily find online. Philip Marlowe is less for the Chandler fan and more for those who enjoy watching even the average TV PI of the late 1950s. TIP OF THE HAT: To RJ of TV Obscurities for helping me find another online source, the Broadcasting magazine archives. I found the TIME article “These Gunns for Hire” to be very interesting. I’ve managed to track down most of these shows either on bootleg or officially released dvds. But this show I’ve had no luck in finding the complete series. Has anyone found a source that sells all or most of the episodes? I also have never come across anyone with copies of the complete series, only the one in the box set that Michael mentions. Whoever does have copies is keeping a tight lid on them. There is, by the way, a longer clip on YouTube from the episode that’s in the box set. Michael and I discussed creating a link to it, but in the end we decided to use the one with the opening credits only. The longer one, as it turns out, also includes the closing scene, which without a Warning, we thought maybe people might not want to know about ahead of time. Love this! Thanks so much. The fact that Phillip Carey played Granny Goose in the TV commercials and Phillip Marlowe (not to mention Asa Buchanan on the daytime drama, One Life to Live, is a tribute to the versatility of the late actor. I am now excited to find this series on DVD. I have found another DVD with Philip Marlowe episode (it does not state what episode but I bet it is this one), TV FROM YESTERYEAR: DETECTIVES. I checked the online sites of UCLA and Paley Center. The Museum of Broadcasting site is down for now. None had any of this series. But then no one knew the Paley Center had ten episodes of CASES OF EDDIE DRAKE. I am hoping David Bushman is reading this and checks the Paley Center’s closet again for me. Thanks for the ‘TV-Obscurities’ -link, Steve ! That can be helpful in finding lost favourites, or , at least, aquaintances in the series- department ! This is a series that I didn’t see in first-run (I was 9 years old when it aired), and it had no rerun afterlife that I’m aware of (which in those days was unusual). – Raymond Chandler’s collected letters, published some years after his death, include several references to the Marlowe series. At least one of them is to a Goodson-Todman executive whose name eludes me at the moment, and concerns itself with the title of an episode about to start filming. This would seem to indicate that Chandler was at the very least being “consulted” about the series’s content, right up to his passing. “Consultant” is a TV term that can mean anything from Erle Stanley Gardner’s micromanagement of Perry Mason to just making sure that the royalty checks are clearing. If any other correspondence between Chandler and Goodson-Todman were to be found, this might be cleared. – Mentioning Gardner above brings to mind that Gene Wang, the writer-producer of this Marlowe episode, came to this series directly from having filled the producer’s chair at Perry Mason for that series’ first two seasons. Since it’s well-known that Gardner and Chandler were good friends, it could be reasonably surmised that Ray might have had some talks with Uncle Erle about the TV business before agreeing to sell Marlowe to the tube. I can see Gardner recommending Wang, whom he’d praised highly in interviews for his Mason work, as the guy to work with Chandler for the best possible results. When I get home tonight I’ll check my ’59-’60 TV Guides and see if I can find anything else. I am a fan of Gene Wang’s work. I first discovered him writing the NBC’s radio series AMAZING MR MALONE. While the mystery in “Murder is a Grave Affair” suffered from being jammed into thirty minutes, and has a few logic flaws, it was worth watching if only for that one twist I won’t spoil. Incidentally, I just saw a film from 1969, where James Garner played Marlowe. I noted in passing that the last big screen appearance of Philip Marlowe was THE BIG SLEEP in 1978, with Robert Mitchum playing the role. Marlowe’s been on TV since then, most notably the Powers Boothe series on HBO, but no films. Perhaps I should be quiet, lest Johnny Depp reads this. Steve, it’s Robert Downey Jr. you have to worry about since he wants to play Perry Mason. Depp wants to play Dr. Seuss. I think Robert Downey Jr. would make a better Philip Marlowe than he would Perry Mason. Which reminds me. Am I the only one who remembers a remake of the Perry Mason series starring Monte Markham? It didn’t last long. I’m sure that it came too soon after the Raymond Burr run, and the shoes were too big to fill. I probably asked this before, because I remember someone (Michael?) telling me that episodes are currently on YouTube. And indeed they are! They do exist. … not a whole helluva lot. First, the caveat: I’m missing maybe a half-dozen issues from the Marlowe series’s actual run. Thus, the Thrilling Detective link has more info than I do. And jolly good for them. But as I was combing through the issues, something curious struck me. That’s how such an ad would have looked in my Chicago edition in 1959. It might have also mentioned a sponsor. Allowing for six missing issues, I also found no stories about the show’s production or Phil Carey. There may have been such stories in the issues I don’t have. TV Guide often ran behind-the-scenes stories about how some series came into being; Marlowe would seem a natural choice for such a story. Anybody whose TVG collection is more complete than mine could be a big help here. Back in those days, advertising agencies had much more to do with network programming, up to and including choosing which network would get to air a certain show. ABC, with less financial resources and a short station lineup, got a lot of their programming from ad agencies who shared their leftovers when there was no room on the bustling NBC or CBS schedules. The agency would find a sponsor or two for a series, and take it to a network as a package deal; whatever didn’t find a slot at CBS or NBC, ABC would grab, and then plug into one of the many open spaces on their schedule. This is why Johnny Staccato switched from NBC to ABC in midseason of this year; the network wanted to drop it, but the sponsor didn’t, and so ABC picked it up for the rest of the season. So that’s what I’ve got. Anybody who can pick up and clarify, go for it. So the show didn’t get any publicity push at all. Do you, Mike, or does anyone know who the sponsor was? At the time (1959) I was one of the biggest “PI on TV” fans around, and when it was on, I didn’t know a thing about it. Since then I’ve always assumed that the lack of an ABC affiliate within viewing range had something to do with it, but back then I read TV GUIDE from cover to cover, and I don’t remember reading about the series at all. The name Philip Marlowe would certainly have caught my attention. Mike, according to BROADCASTING review September 28, 1959, the ad agency was Ted Bates. Over at Archive of American Television there is an interview of Philip Carey. At the 10:51 point of the hour long interview he discusses PHILIP MARLOWE. The RapSheet.com had featured it in a post from long ago. I didn’t use anything from the interview because it muddle up some things. Carey mentions being paid by CBS for the pilot, I think. He is talking about how his people got him out of the Columbia Studio contract so he could do the pilot. He talks about doing 39 episodes, but that they were suddenly cancelled (the cameraman told him). He says Grey Advertising was running things. It is just my guess, but if Chandler had lived I think NBC would have kept the series and promoted the heck out of it. Similar to the old radio shows using Hammett’s name. Without Chandler, NBC lost interest and it was dumped on ABC. Steve, you would be surprised what you can find on You Tube and some with great quality. NEW ADVENTURES OF PERRY MASON was not good. It wasn’t bad, but it needed Raymond Burr. Question for Perry Mason fans, did Erle Stanley Garner ever describe the character in any of the books? Answer to the question does more episodes of PHILIP MARLOWE still exist. Yes. The Paley Center for the Media in NYC and L.A. have this episode and “Child of Virtue” available for viewing. Wonder who owns the copyright for the series? – Throughout his life, Raymond Chandler was notoriously press-shy. He rarely gave interviews in print, and was never (to my knowledge) interviewed on radio or television. Chandler did do a show for BBC Radio with Ian Fleming once, but that was more of a conversation than an interview. You can find it online; it’s the only known recording of his voice. Using what we know, had Chandler lived, his involvement in the Marlowe series would have been minimal, possibly not much more than reading scripts and banking the royalty checks. If NBC (or ABC, for that matter) could have gotten him to do publicity for the show, it would have been contrary to Chandler’s known attitudes about such things. In 1960, there was a Michael Shayne series on NBC,starring Richard Denning. Brett Halliday (Davis Dresser) did quite a bit of PR for the show, including a TV GUIDE article about how much he loved the idea of his characters being on TV. I don’t see Raymond Chandler doing something like that. – Phil Carey’s interview was 40 years after the fact, so if some of his memories don’t quite square with the record … so be it. He was sure fun to listen to, though. – Erle Stanley Gardner rarely described any of his characters much beyond the bare basics – age, build, dress – he wanted readers to build their own images. When I read some of the Perry Mason books after having grown up with the TV show, I was brought up a little short to read that Lt. Tragg and Mason were supposed to be around the same age. Later on I learned that Gardner’s friends were startled to see 70+ year-old Ray Collins in the part. But he was Uncle Erle’s choice and that was that. Hammett never promoted THE FAT MAN radio show but they sold it as if he had written it. 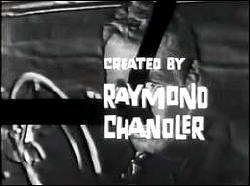 Just having “Story editor Raymond Chandler” in the credits would have gotten it more attention whether he did anything more than cash the checks like Hammett did. Considering Chandler’s rep in Hollywood as being difficult to work with, I am amazed he could have still been involved two years after he first signed over the rights. While it is a possibility to consider, my guess the series just was not good enough for NBC. But again it was the ad agency calling the shots and while I have not seen the ratings for PHILIP MARLOWE, I know it was opposite of Red Skelton who was fifth in the ratings that year. That is why I think it got cancelled. I wonder why the series was not called RAYMOND CHANDLER’S PHILIP MARLOWE. But this is half the fun of research, putting pieces of a puzzle together with only your own POV guess as a clue to what the picture looks like. Mike, (or anyone else)if you can please check your TV GUIDES collection after 1960 and see if PHILIP MARLOWE reruns were ever syndicated. I am off to check my sources. I’ll give ’em a look, but I’m pretty sure that no Chicago station played Philip Marlowe reruns post-’60. The odd part of that was that in those days, almost every series that played on a network had a rerun afterlfe – including many that only ran half a season.The practice of stripping – running shows five nights a week – didn’t really take hold until the late ’60s. But I will look – and while I’m looking I’ll keep an eye out for short-run shows that lived after their network life. Thank, Mike. I am starting to suspect copyright confusion may be a cause for why this series seemed to fall off the edge of the Earth. Heck, I just bought BRENNER for $23 at Amazon, can you imagine how much this series could pull in? Found it. PHILIP MARLOWE (26 episodes) were offered in syndication by NBC Films Inc as late at 1967 (BROADCASTING March 27, 1967). The color boom probably reduced the black and white syndication worth after that. I was able to find one (1) ad for Philip Marlowe in TV Guide. The premiere episode was heralded by a half-page ad, three pages away from the actual listing (my alibi for missing it). The ad announces PHILIP MARLOWE – Based on Raymond Chandler’s Stories! – starring PHILIP CAREY (slightly smaller lettering than the character, with accompanying photo) – Premiere Tuesday 8:30 on 7 – 28. That’s about two-thirds of the space. The bottom third belongs to the sponsor – LIFE cigarettes, a new brand featuring one of those super-scientific filter tips that take out the icky gook so you can enjoy the pure, clean, pristine smoke that God intended. I never did find other ads for Marlowe in TV Guide or anywhere else. As for syndication, I can’t find any indication that Marlowe played on any Chicago station post ’60, but here I have to cop to getting the bends when I try to read those old listings for any length of time (I just turned 61, and my eyes are even older). As I mentioned before, the idea of striping shows five-a-week was a few years away, and there were so many shows available, both off-network and original (Ziv and such),for a limited amount of timeslots (all-night programming was also a few years away), that many shows just got crowded out of the market. I write these words from Chicago, the cradle of MEtv, and if they can find space for Honey West, you’d think they might find a spot for Philip Marlowe – if it can be found. Thanks, for taking a look. I can understand the eye strain. I have major eye problems and am thankful the computer allows me to adjust the size of print. Regarding episodes, Michael is right that we at the Paley Center have at least one episode, titled “Child of Virtue,” which I just watched; Marlowe is hired by an ex-gangster to babysit his 18-year-old daughter for a week because the guy is headed to Havana on a business trip and is worried that some layabout who is after his money is going to whisk his daughter away to Las Vegas and marry her ($1000 upfront, another $1000 upon completion of the assignment). The episode is directed by Irvin Kershner (“The Empire Strikes Back”). What I particularly like about it is that it is set almost entirely at night. I also like that Marlowe takes a couple of beatings, like any noir hero worth his salt. We MAY have more episodes of the series; I am looking (sometimes we have shows that are not identifiable by their database entries, and not immediately available for viewing). We do also have episodes of the “Philip Marlowe, Private Eye,” the mid-80s HBO series starring Powers Boothe, but that is another story. Thanks, David for checking for us. I may turn my attention to interviews and books featuring Chandler during 1957-61. But there is great interest among TV mystery fans and Raymond Chandler fans to see more of these episodes. If NBC (who owned the syndication rights in 1967) still have the copyright, they’d be smart to put this out on DVD. This post of yours has attracted a lot of attention, Michael, so here’s hoping! mike, I doubt the series will make it to DVD or streaming soon. The problem may be lack of surviving episodes. The key clue is usually who owns the rights to the show. Goodson-Todman, famous for its game shows, most likely owns it. Small independents rarely had the budget to preserve its library of failed shows. California National Production offers some hope as CNP was owned by NBC and used by NBC to syndicate TV-film shows during the 50s and 60s. You might check with Shout Factory, it enjoys finding and putting out series similar to this one. Visit Shout Factory website or Facebook page, the company is fan friendly. I think, that I can answer some of your Philip Marlowe questions. 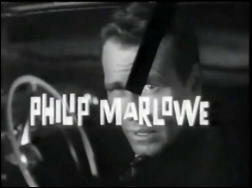 When Phil Carey shot the pilot, in 1958, it was titled: “Raymond Chandler’s Philip Marlowe”, and was made by Desilu, in association, with CBS (as Phil stated), not ABC or NBC. It was directed, by Ted Post (“Hang ‘Em High”), written by E. Jack Neuman (many TV shows), and produced by Matthew Rapf (much TV, too). This 29 minute pilot was never shown, as part, of the series, and remains unaired, to this day. Among the guest stars, were Peckinpah regulars, R.G. Armstrong and Strother Martin, and the alluring ladies were Jean Allison, Barbara Stuart, and Kathy Marlowe. Many years ago, I owned a 16mm print, of this rare film, which I had the foresight to transfer, to beta tape, then later, to dvd, so all these facts are, from first hand knowledge. Hope this info fills in some, of the gaps. Thanks Ed! Any chance of sharing that treasure on YouTube or Vimeo or etc? If not, I do hope you make a copy for one of the TV history libraries UCLA, Paley or Museum of Broadcasting. That is TV history I hope never gets totally lost. Thanks again for sharing the details. I just ran across the MysteryFile blog and the discussion of the Philip Marlowe TV series, with Philip Carey. I’d almost forgotten about it. My father was Gene Wang, the producer/writer of the show. I never heard from the Writers Guild about syndication, so I assumed it was never picked up. As far as promotion, there was a TIME cover story, on October 26, 1959, which gave it some exposure–but I don’t recall Marlowe getting the attention that some of the other new shows received. The blog looks very interesting. Having been surrounded by crime fiction as a kid, it’s an interest that becomes lifelong. Thanks for the site. I’ll continue to dial it up. The Malone TV series is top of my long list of lost TV series I am hoping some day to watch. Your father was one of the key writers of light mystery in radio and early TV, he should be better remembered. Thanks Michael. I’m sure he would have appreciated the compliment. He was hired, out of Univ. of Florida Law School, by Phillips Lord–“Mr. District Attorney,” “Gang Busters,” etc. Later he did “Malone” & “Adventures of The Falcon,” along with this and that. He got the job with “Mason” when the series started in the late ’50s and then did “Marlowe.” Following that, he developed a series, “Trials of O’Brien,” starring Peter Falk for Filmways. Falk was very hot property then & brought in his own people to take charge; they then changed the character. The show only had a short season. Later Falk did “Columbo,” and claimed the character to be his creation. All that business–the rumpled suit & wrinkled trench coat–had been lifted from the original “O’Brien” concept. In fact, in the pilot, O’Brien’s office door was supposed to read S. (Sean) L.(Lucas) O’Brien–or SLOB. The character was modeled after my father, himself–someone very good at what he did, but who seemed to need a lot of help with organization & neatness. He didn’t live to see “Columbo” produced, fortunately. Just thought you might be interested. I have a few TRIALS OF O’BRIEN episodes that wait on my to be watched list. Currently I am ill and too tired to write the comment I wish to write here with some question. Hope to see you are here when I am back to full speed. I know I am not the only one who would love to know more about your Dad. How about a casual bio post about your dad and you? Steve Lewis runs things here and you can contact him at the contact line at top of each post -if you are interested. It was common during the 60s and 70s for the star to run the series. Pete, your Dad probably would identified with what the producers and networks had to deal with on COLUMBO. As a Craig Rice and John J. Malone fan I wish more survived of the radio series and anything survived of the TV series. Were the TV series episodes based on the radio series episodes? IMDb needs someone to add a full bio of your father. As one of the my favorite writer/producers who made the transfer from radio to TV his life story could tell us much about an important and increasingly forgotten era. Was he part of the New York scene or was in Los Angeles from the beginning? Did he do any radio or TV shows that are forgotten – such as pilots or West Coast only shows? Love to see this series..watching one on YouTube..would love to see the unaired pilot..